In the eight years that we have been producing Phantom Galleries - art in vacant storefronts project - we have come to know so many artists that inspire us, day in and day out, with their creative and dedicated way of life that inevitably leads to a thriving art scene here in San Jose. And so we thought it time we help introduce them to you through a new interview series we're kicking off simply called "Phantom Interview." First up, Miss Lacey Bryant - enjoy! Where did you grow up and when did you decide to become an artist Lacey? I was born in Kentucky to my surprise. I quickly corrected the situation and moved to the bay area when I was 5. I don't know that I ever "decided" to be an artist. I was an artist when I was a little kid, just like most little kids. I just didn't quit. I did start taking art more seriously in 2004. Since then, making pictures is pretty much all I think about. 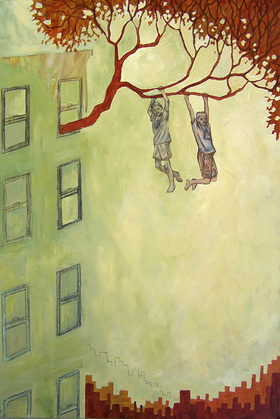 I think we first met you when you showed up to paint live at one of Anno Domini STREET MRKTS - I was really impressed at your imagery, how quick you were and professional you were....I think it was the beginning of your Apartments Full of Dirt series - can you talk about the girls in the trees coming through the buildings? Aw, thanks! I like things that are absurd and the idea of a tree growing out of a tall building was pretty funny to me. That was the beginning of the idea. After I kicked it around awhile I decided to put girls in the trees and have the girls wearing dresses (I got a few of my friends to climb up and pose for me). I have always loved climbing trees and I like the idea of climbing a tree in a dress because it's one of those things that I was told not to do as a kid. It's like saying "so what"? I wanted it to feel like a sort of fantasy, as if the girls had a secret world of their own high above the city. It's very playful, some of the girls are throwing paper airplanes or talking on a cans and string phone, some of them are just relaxing. I tried to focus on giving a sense of space and on letting the city almost fade away, indicating only the windows and the shadows of the trees on the edges of the buildings. I wanted the fantasy to feel more solid than reality. I heard that you were asked to do a commission piece from that series but the collector wanted her two young sons to be the figures in the painting - how did you feel about that? And was she happy? Yeah, sometimes people commission me to make portraits. I enjoy painting a likeness as long as I'm free to interpret the image in my own way. The idea is that you hire someone to paint you because you like the way they see things. This one was fun because she saw the work I was doing and wanted me to make my own style of work using photos of her 2 sons. I found out that one of the boys I was painting is blind, so I built up the paint so that he would be able to feel the shapes on the painting. I had fun with that and she really liked the painting. A few months ago you painted live for a week in the windows of Camera 12 as part of the Cinequest Festival experience, along with Drew Clark and Manny Silva, and the canvas was huge, compared to you....did you enjoy that experience? 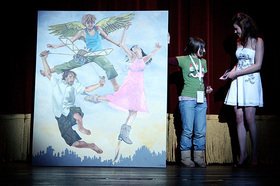 I love painting live and I also got to hang out with a couple of really awesome artists, so it was mega-fun! I got to catch a ton of films at the festival, too. It was different from other live paintings I have done, as most of the time live paintings need to be completed in just a few hours. I do paint very quickly, so I enjoy the energy of live painting. This time I had the whole week to work on it, so I got to take my time and refine the piece a lot more. I was also able to use oil paints because there was adequate time for drying. I do love to paint very large pictures, making big, bold marks and slinging paint around and generally making a big mess. I like how a large picture can really pull you into the world of the painting. It wasn't the largest canvas I've worked with by a long shot, but it was still over a foot taller than me. I was told that when I carried the painting it looked like the canvas was moving on it's own! Commissions, painting live, art shows....you seem to keep really busy. I know there's a lot of conversation about starving artists in good times, not to mention really bad times, how do you piece it all together especially in this incredibly expensive area? I'm just astoundingly lucky! Really, I think it's a matter of living simply and having a good attitude, at least for me. There are plenty of ways to make a living creatively, even when everyone says the sky is falling. I am pretty lucky, fun art jobs find me a lot. I like variety, so it's perfect for me. 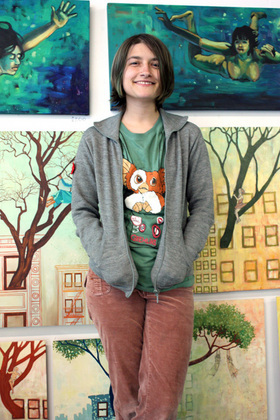 I work at a screen printing shop doing graphic design and at KALEID Gallery regularly. I have studio space at KALEID so I'm able to work on my art while I'm at work, so that helps me to pay the bills while getting to make lots of pictures! I also paint sets and haunted houses for Great America theme park, some theatre groups and the occasional kid's room. In October I carve Giant pumpkins for Pumpkin Depot in Half Moon Bay. I made a rule for myself that I would never do work that I don't like or feel good about and so far I've been fortunate enough to keep to that. You have a solo exhibit featuring all new works at Gallery TEN10 on July 31st _ can you tell us about the series and the subject matter? The show at TEN10 is called Distracted. The work is about having conflicting thoughts or emotions. 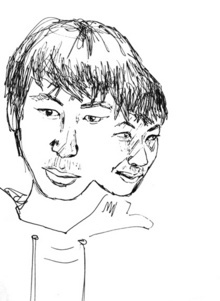 I made ink drawings of people, mostly friends and fellow artists, and gave them 2 faces. 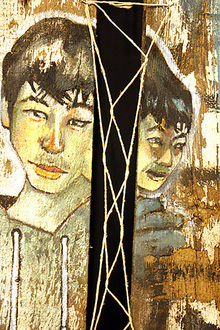 I used the drawings to make oil paintings on found wood. I left a lot of the original wood showing and let a lot of the paintings retain an unfinished feel. I start out with an idea in mind for a series, but as I work on the pieces the ideas change or are somehow added to by other thoughts or by how the work evolves. While working on this series I realized I was also working with the idea of reduction, or making a copy of a copy. The ink drawings reduced a person down to simple black and white, eliminating a lot of the complexities of color, light and shadow. It was fun to see what happened when I reconstructed the faces in paint, selectively bringing back some of that complexity. I'm also going to show a few of my linocuts and other pieces I've been distracted by during the time I've been working on these pieces. I'm always working on a few different things at the same time, distracted definitely fits me! I'm pretty excited about the show and I'm very grateful to my friends for letting me paint them as freaky two face people! This page contains a single entry from July 28, 2009 4:11 PM. The previous post in this blog was "Lunch with John and Vincent" Group Exhibit at On the Corner Music. 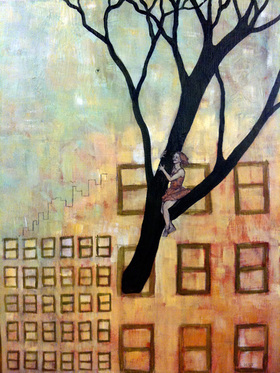 The next post in this blog is "TANGLE: wandering off trail" Exhibition at KALEID Gallery Aug. 7th.